This is for all you Godzilla fans out there. It’s not in individual comic release form but even graphic novels have a place for most of us that still actually read comics. 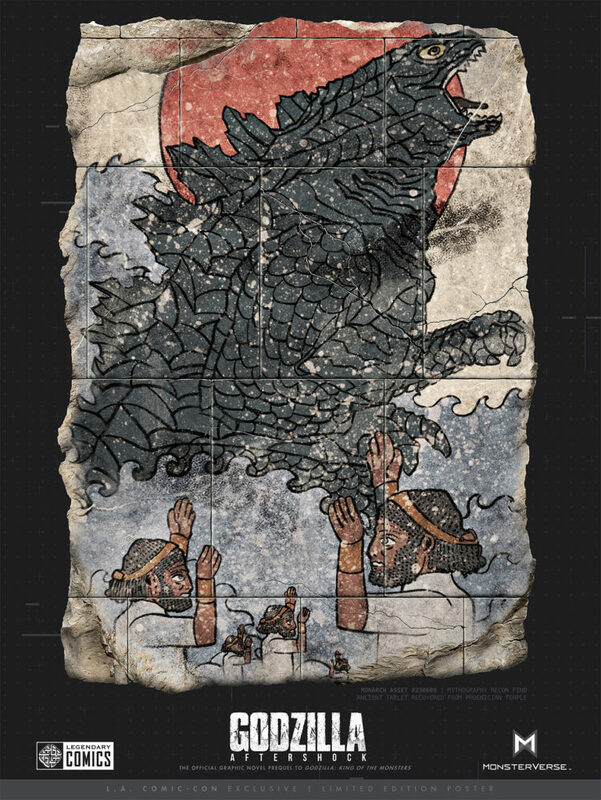 Also for those attending the Los Angeles Comic Con this weekend, be sure to check out the Legendary Comics panel “Godzilla: Secrets of the MonsterVerse” in Room 403B on Saturday, October 27 at 3pm. First 500 get a numbered limited edition poster. There’s actually money in flipping posters. Anyone ever hear of Mondo Con ? In anticipation of next summer’s big-screen blockbuster, Godzilla: King of the Monsters, Legendary Comics announces the thrilling companion graphic novel GODZILLA: AFTERSHOCK, written by Arvid Nelson, with art by Drew Edward Johnson. Continuing the story of 2014’s Godzilla after the catastrophic events in San Francisco, the King of the Monsters finds himself once again threatened as a terrifying new foe rises from the depths of the earth, unleashing a series of devasting earthquakes and driven by an unstoppable primal instinct that will test the King of Monsters like never before. Godzilla: Aftershock will be available online and in stores in Spring 2019. Follow Facebook.com/LegendaryComics for the latest news and updates. Artist Drew Edward Johnson started drawing comic books in 1995 with Dark Horse Comics’/Lucasfilm’s Star Wars X-Wing: Rogue Squadron . His work has since been published by DC Comics, Marvel Comics, Top Cow, DDP, and Wildstorm. Drew is best known for his work on DC Comics’ Wonder Woman #195-210, #211, and #214. Other ongoing series work has included DC Comics’ Supergirl, and Wildstorm’s The Authority . Over the course of his career, Johnson has been a member of Macon, GA’s Jolly Roger Studio; Macon, GA’s Studio Phoenix, which he co-founded with Ray Snyder and Dan Jolley; and Portland, OR’s Mercury Studio, which is now known as Periscope Studio. These days, Drew lives in Burbank, CA with his wife, Animator/Director Karen Carnegie Johnson, their children Cole and Quinn and a really dumb cat named Lucy. Legendary Comics was born out of a passion for mythic entertainment, seeking out new talent and working with the best and the brightest in the industry to create transportive worlds, inspirational characters, and spectacular adventures that leap off the page. Founded in 2011, Legendary Comics has produced an exciting catalogue of original titles that continues to grow and evolve. From partnerships with industry legend Frank Miller to Grant Morrison’s Eisner-nominated Annihilator, Legendary Comics has a passion for innovative new stories, including Marc Guggenheim’s The Adventures of Jonas Quantum, the fantasy action series A Town Called Dragon, and Jessica Chobot and Erika Lewis’ hit webseries, Firebrand: The Initiation of Natali Pressano. In addition to original titles, Legendary Comics also expands the scope of the cinematic universes of its parent company Legendary Entertainment, by bringing big-screen adventure exploding onto the comic book page. Working with the visionary filmmakers and the architects of Legendary’s Monsterverse, they have delivered the level of quality and authenticity our fans demand with New York Times best-sellers such as Godzilla: Awakening and Pacific Rim: Tales From Year Zero, and Skull Island: The Birth of Kong, to name a few.